If there’s ever been a show for lovers of joe, it’s Twin Peaks. The cult classic was basically a 30-episode ode to “damn fine coffee” (in the immortal words of Agent Dale Cooper). Our count brings the coffee references to 70 (spoken) in total. That’s a lot of joe. The single-mindedness about coffee isn’t surprising, given that the show’s creator is iconic director David Lynch. This is the man who once quipped, “Even bad coffee is better than no coffee at all,” and who has his own signature line of beans that superfans can purchase online. Twin Peaks was so ahead of its time when it comes to coffee obsession (among other things) that Showtime even released an old-school coffee-themed teaser ahead of the show’s return. 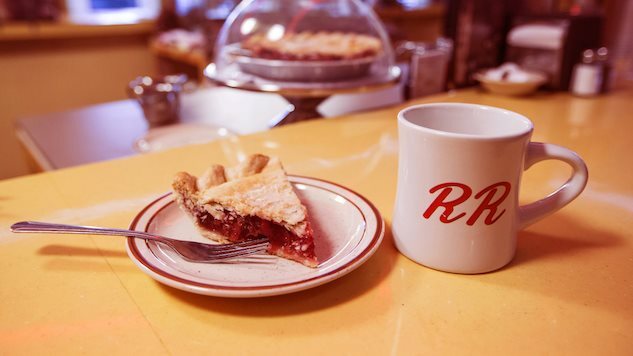 So if you want to explore the show’s love affair for all things steaming hot and “black as midnight on a moonless night” — here’s a timeline of memorable coffee moments in the town of Twin Peaks. Agent Dale Cooper, aka Coop, actually mentions coffee in his first appearance on the show. He records a voice memo to his (perhaps imaginary) colleague — Diane. Harry and Coop stop for coffee at the Double R.
Coop: Harry, I’m going to let you in on a little secret. Every day, once a day, give yourself a present. Don’t plan it, don’t wait for it, just let it happen. It could be a new shirt at the men’s store, a catnap in your office chair or two cups of good hot black coffee. Like this. Harry: A present? Like Christmas? Coop: Ah, man that hits the spot. Nothing like a great cup of black coffee. Later, Maddy (Laura Palmer’s lookalike cousin) comes to the Double R and runs into James (Laura Palmer’s former boyfriend and current boyfriend to Donna Hayward). Maddy: Can l get a cup of coffee to go? James: So you seen Donna today? James: No. So, what’s with the coffee? James: You don’t have coffee at home? Maddy: James, l can’t talk now. l need to go. James: You need to go? Where are you going? Later, Nadine and Big Eg hit the Double R.
Nadine: Two chocolate shakes, please, Norma. Ernie returns to the Double R after a weekend up at One Eyed Jack’s (a brothel over the Canadian border, owner by Audrey Horne’s father Ben). He asks Norma: Could we get some coffee?” She tells him to go back to Seattle. Norma and Ed have a meet-cute at the Double R.
Norma: Is everything aII right, Ed? Donna heads to Wallies Hideout, a bar a couple of hours outside of Twin Peaks, looking for James, who’d skipped town. She orders coffee at the bar. James’ new older lover, Evelyn Marsh, pays for Donna’s coffee. Harry and Coop are also at the Double R, with Harry hungover due to the death of Josie Packard (his lover) and a subsequent drinking binge. Harry: No, all l need is some coffee, maybe a little food. (Coffee cures all ills in Twin Peaks). Later, Coop comes to see Annie. “Coffee?” she asks. “You bet,” he replies. (The s*** has officially hit the fan.) Coop is in the Black Lodge (an otherwordly place of pure evil). Harry and Andy are awaiting his return. Andy (to Harry): Do you want a thermos of coffee? Andy: Do you want a pIate speciaI? Andy: Do you want dessert? While in the Black Lodge, “The World’s Most Decrepit Room Service Waiter,” (an extremely elderly man who once brought Coop some hot milk as he lay bleeding from a bullet wound) brings Coop a cup of coffee while repeating “coffee” six times. And there you have it. All the memorable coffee moments in Twin Peaks. While we can’t say for sure whether David Lynch’s caffeine obsession is as robust as it was 26 years ago — it’s a safe bet to assume the reboot will have its fair share of odes to to the stuff.